Cute panda stickers brought to you by Rakuten Ichiba! 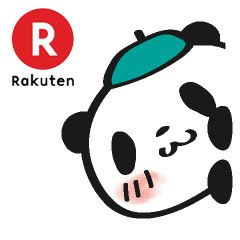 Add Rakuten Ichiba's official account as a friend to download them for free! The popular Rakuten Shopping Panda stickers are back to help you bargain hunt! After over 500 million uses, Shopping Panda's third round of stickers is here! Shopping Panda's back with his tiny pal! Friend Rakuten Ichiba to get the latest set in the series used over 1 billion times. Shopping Panda is back with his little buddy in his 5th sticker set! Shopping Panda is back with the most popular stickers from past sets! Panda and his furry little pal are back and better than ever this summer. Their smash hit sticker set sent a total of 2.6 billion times is also back for a limited run! The Shopping Panda is back with his pint-sized pal and they're more animated than ever! Their animations will bamboozle your friends! Brand new stickers join old favorites for a total of 16 stickers. This panda who's starred in stickers sent over 4.9 billion times is ready for some pure shopping panda-monium! Now that's a deal this panda likes. Brand-new Shopping Panda stickers are here just in time for the Christmas rush! 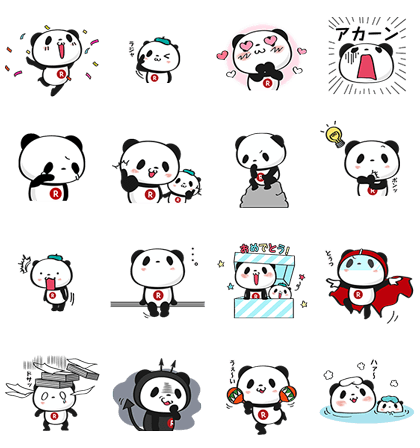 Expressive Panda stickers will make your daily communication more fun! 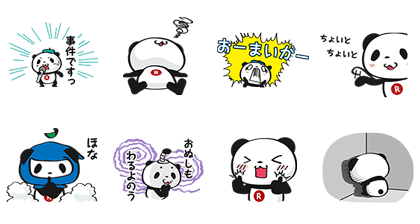 Friend Rakuten's official account to get these remarkable stickers(used over 5.5billion times and counting) for free. You can't hold the Shopping Panda back! Laughing or crying, it's never a dull moment with this panda! You'll find some stickers perfect for winter too! Sent over 73 billion times, this unstoppable series just keeps going! A new year and a new set from the Shopping Panda! This playful panda's fun doesn't stop, whether they're thinking hard, taking to the sky, or enjoying a nice soak. Sent over 7.6 billion times and growing, this series just keeps going! Shopping Panda comes back for more LINE fun, with stickers selected with the help of Shopping Panda fans everywhere! Sent over 7.7 billion times and climbing, this unstoppable series just keeps on going. Shopping Panda's new animated stickers are here! Ideas selected by vote have also been included in this set. Find your favorite and send it to your friends! Shopping Panda's new animated stickers are here—and he's got some new moves! Shopping Panda is on the move once again with these animated stickers! These lively stickers are just the thing to brighten up the cold winter months ahead. Start off 2019 with a little animated Shopping Panda fun! This panda’s got all the right moves, so fill up your chats with these great stickers! Leap into the spring season with Shopping Panda! As always, this expressive panda has plenty of fun stickers to go around. Looks like there’s a new panda in the mix too! Friend Rakuten’s official account to get the set for free.